The Vodafone Group reported six month revenue of £19.1 billion, an increase of 2.5%. The increase was driven by the acquisition of CWW and TelstraClear in the prior year. Organic organic service revenue on a management basis declined 4.9%; Northern & Central Europe down 4.9%; Southern Europe was down 15.5%, and AMAP (Africa, Middled East and Asia Pacific) was up 5.7%. Profit for the period from continuing operations increased by £20.0 billion to £15.7 billion, primarily as a result of the recognition of additional deferred tax of £14.7 billion in the current period and an impairment charge of £5.9 billion in the prior period. Regarding the sale of Vodafone's state in Verizon Wireless, the company expects to realise a gain on disposal of between £45 billion and £50 billion, which will be recognised on completion. The exact figure will depend on a number of variables, primarily the sterling/US dollar exchange rate and the Verizon share price at the time of completion. 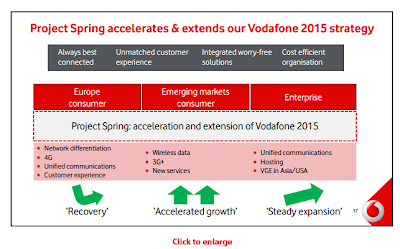 Vodafone also announced "Project Spring" to seize the attractive long-term opportunities and mitigate adverse factors in the telecommunications sector. The announcement, which builds on the "Vodafone 2015 Strategy announced in November 2012, boosts the company's CAPEX spending by £7.0 billion through 2016 with the expectation that the European economies will begin to recover in the medium term. Project Spring spending plans include an investment in Europe of around £3 billion to deliver deeper 3G coverage and capacity This will accelerate the 4G network build, supported by single RAN and high capacity backhaul. In AMAP, Vodafone will invest around £1.5 billion to extend 3G coverage across major cities and key regions to provide wider voice coverage and the best data experience. 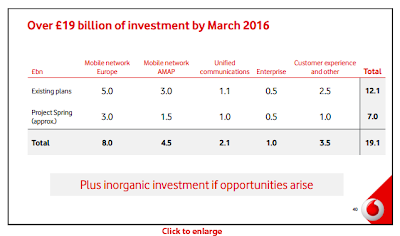 Vodafone will invest approximately £1 billion in unified communications. 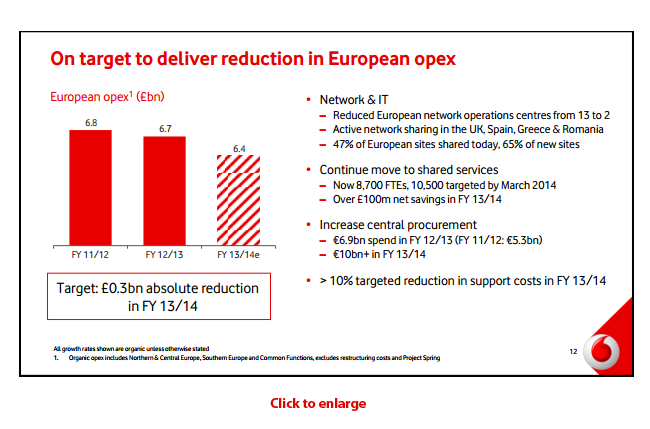 In Europe, Vodafone will increase xDSL and fibre footprint to provide competitive unified communications solutions. In AMAP, Vodafone will establish a fibre footprint to enable converged services in key business areas. geographic coverage for our core Enterprise business as well as M2M solutions and Vodafone One Net, whilst accelerating IP-VPN in nine major markets. Vodafone will increase its hosting capability and invest in traffic routing systems to build its carrier services business. currently 47% of European sites are shared today and 65% of new sites are shared. Smartphone penetration in Europe is now 39% and 57% of mobile service revenue in Europe is in-bundle. Data usage continues to grow with average usage per device now 400MB per month. Vodafone will continue to invest in HSPA+, 4G and high capacity backhaul. 56% of Vodafone's 3G footprint in Europe now operates at peak speeds of 43.2 Mbps, up from 29% one year ago. Vodafone has now launched 4G services in 14 markets and unified communications capability in 12 markets. Turk Telekom has tested a 2T WDM system from Huawei on its live network. The field trial achieved groundbreaking 40 Tbps C-band transmission over a single fiber over 307 km of G.652 fiber between Ankara, the capital of Turkey, and Cankiri. Huawei said its WDM system used advanced 32QAM modulation to deliver a net SE of up to 8 b/s/Hz or 40Tb/s C-band transmission, meaning a capacity four times higher than mainstream commercial 100G systems. In addition, using Hybrid QAM technology with 20 Tbps capacities, the trial link consisted of fiber loop between Ankara and Istanbul, stretching 1,750 km without regeneration. Hybrid QAM technology allows software-defined tuning of modulation formats such as QPSK, 8QAM, 16QAM, 32QAM, and 64QAM for different optical signals, bringing unprecedented flexibility in service-specific capacity and transmission distance configurations. In 2010, Turk Telekom built the national backbone network that stretches more than 34,000 km using Huawei's next-generation WDM system, and in 2012, it deployed Huawei's coherent 100G solution. Driven largely by the mobile segment, spending on standalone DPI solutions to grow 30% year-over-year in 2013, according to a new report from Infonetics. Mobile operators are turning to deep packet inspection (DPI) to better manage bandwidth use and to create innovative and bundled services. The concept of "DPI inside" is gaining traction as manufacturers embed DPI into larger solutions such as video optimization, content charging, and service assurance. 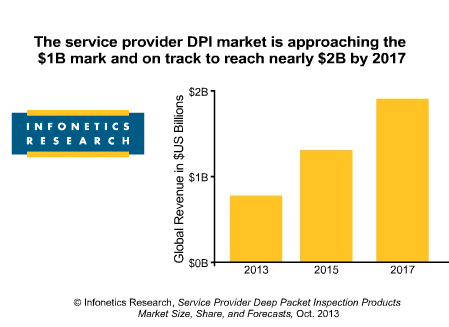 Sandvine passed Allot to take the lead in the DPI market in the first half of 2013 (1H13). Amazon's "AWS re:invent" conference this week in Las Vegas (Sands Expo Hall) is completely sold out. 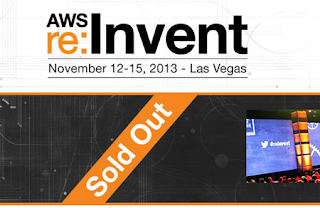 The event has over 175 scheduled sessions covering best practices for AWS services, training bootcamps, hands-on labs, and hackathon. The registration fee was $1,299. HP released StoreVirtual Virtual Storage Appliance (VSA) software for its virtualization-ready HP ProLiant Generation 8 (Gen8) servers. The software, which is available at no additional cost, transforms HP ProLiant servers for software-defined storage. Reduce costs of deploying resilient shared storage by up to 80 percent compared with traditional storage arrays. Simplify deployment and improve flexibility with either VMware or Microsoft hypervisor environments without the need for dedicated storage expertise. Enhance agility by scaling compute and storage in parallel as business needs change and application workloads grow. Reduce risk by keeping data highly available through clustering and built-in disaster recovery including VMware Metro Storage Cluster support. The OpenDaylight Project, which is a community-led and industry-supported open source platform to advance Software-Defined Networking (SDN) and Network Functions Virtualization (NFV), named Nicolas "Neela" Jacques as it executive director. 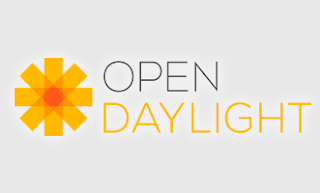 Jacques will work with the OpenDaylight community to advance SDN and NFV with a developer-driven open source platform for products and technologies that expand the intelligence, programmability and performance of network infrastructures. Jacques previously served at VMware as part of the core team that took virtualization from a niche development and testing product to ubiquitous use. He developed and took to market the company’s software-defined data center vision and strategy including VMware’s vCloud Suite. Jacques also founded and launched VMware's first cloud computing initiative in 2007. Prior to VMware, Jacques was a consultant with Bain & Company. Orange is taking the start-up fab that it has developed in Silicon Valley and expanding the programme to other regions. New Orange Fab programmes are being launched in France, Japan for the South-East Asia region, and Poland. The concept is to enable start-up entrepreneurs to focus on their growth, to launch their services on a global scale, and to create products and services that enhance the current world of telecommunications. “Welcoming students, engineers, developers, designers and entrepreneurs to our premises forms an important component of our strategy to engender open innovation, to innovate more quickly, with greater agility, in tune with our company culture. Orange Fab is absolutely part of that process,” explains Stéphane Richard, Chairman and CEO of Orange. T-Mobile US plans to offer 66,150,000 shares of its common stock in a registered public offering. The sale could raised about $1.8 billion for the company. T-Mobile said it will use the net proceeds for general corporate purposes, including capital investments such as acquiring additional spectrum in private party transactions and/or government auctions. T-Mobile intends to grant the underwriters in this offering the option to purchase up to an additional 6,615,000 shares of its common stock.